Are you looking to learn about the records set by a tornado? Then you've come to the right place! We put this section together to give students, teachers and/or tornado enthusiast as place to get tornado record facts and information. This list is by no mean an exhaustive list. But we tried to put the most important ones. If you would like to see some records added or would like to report inaccurate information please contact us. The fastest winds observed in a tornado was during the F5 1999 Bridge Creek–Moore tornado on May 3, 1999 in the southern Oklahoma City metro area. The winds was measured to be 302 miles per hour (486 km/h) by a Doppler on Wheels radar. The longest damage path and duration by a single tornado belongs to the Tri-State Tornado. It had a path length of 151 to 235 miles (243 to 378 km) and lasted 3.5 hours. It also hold the deadliest tornado record in United States history. The deadliest tornado in world was the Daulatpur–Saturia tornado in Bangladesh on April 26, 1989. It killed approximately 1,300 people, left 80,000 people homeless and injured 12,000. The most extensive tornado outbreak was the 2011 Super Outbreak. 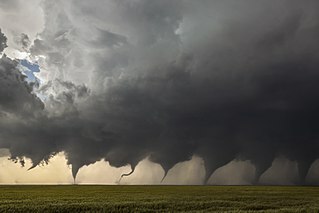 It featured 360 tornadoes from April 25 to 28, 2011. It was also the largest, costliest, and one of the deadliest tornado outbreaks ever recorded, affecting the Southern, Midwestern, and Northeastern United States. Most tornadoes in single 24-hour period is 216 on April 27, 2011. This happened during the 2011 Super Outbreak which affected the Southern, Midwestern, and Northeastern United States. Most damaging tornado adjusted in wealth and inflation was the 1896 St. Louis–East St. Louis tornado on May 27, 1896. It caused over $10 million in damage in 1896 or $4.45 billion in 2015 dollars. The widest tornado on record is the El Reno, Oklahoma tornado of May 31, 2013. At its peak, it had a width of 2.6 miles (4.2 km). The highest forward speed of a tornado ever recorded was 73 miles per hour (117 km/h) by the Tri-State Tornado. The longest distance a person carried by a tornado and lived, belongs to Matt Suter of Fordland, Missouri. He was sucked up and out his mobile home and was carried 1,307 feet (398 mmeters) on March 6, 2006 by an F2 tornado. The costliest tornado in recent history was the 2011 Joplin tornado. It struck Joplin Missouri on May 22, 2011. The EF5 tornado damamage and insurance payout cost was estimated to be $2.8 billion in 2011 US dollars.